Well before I ever became involved with the Major Nichols gang and Alvin Smith, the MN V-CC marque expert, I had seen a double fishtail motif on a Pollard badged frame. Now that feature is better known to most of us as Major’s trademark motif. Had that frame in fact been a Major Nichols? What ‘other’ frames did Major build I thought? Alvin and Dave Clement had already set out the then known information as a baseline some years ago. The only known surviving original records for Major Nichols are now held by the Black Country Living Museum. This list shows frame numbers and notes of names of bike commissioners including bike shops between June 1956 and an unknown date well into 1971. Alvin has transcribed the list as an accessory to the Major Nichols Register. It shows that about 150 frames/ bikes were built for other shops or outlets in that 1956 -71 period. These none “Major Nichols” frames are set out as with their details from the original listing in the appendix to this note, bundled for this purpose into their respective ordering shop/outlets and the total numbers shown for each shop. Before and after these dates nothing is formally known other than data on a small number individual frames and bikes which have been recorded and verified. One can only hope that the later shop records stolen from the Smethwick shop turn up. The shop record itself makes no mention of MN in numbering until June 1956 but we know from former owners that it was used in that era and the surviving pre 1956 frames give us proof that this is the case. The record shows about 18 shops. Major was a shrewd businessman and would do what he needed to spread his name and make a living. I believe that the unidentified shop in Hall Green was the 113 year old and still going, Scott Cycles. A Wilson frame appeared with the full wrapover and the double fishtail motif. It had a contrary number but in our joint view had been built by Major. This was not long after the website was launched and caused quite a stir. I began to look out for these makes and then a second almost identical Wilson appeared – it had a number in the record but no MN. Both were in original paint and now we had some real proof that Major built the Italia set out in the Wilson’s advertisement. A question in my mind now is did he also build the Wilson Championship model as ridden by Bob Coe? Between 1956 and 1971 we can probably verify other survivors if they are in a known shop livery and in original finish by the double fishtail motif presence. A problem is that so few Wilsons have been found and so evidence is far from complete! A Tower Cycles road bike of quality was sold a couple of years ago which on the face of it looked extremely like an MN in form, detail and finish but with a totally different frame numbering system, possibly Tower Cycles own. It could not be confirmed as a MN build because of this. Perhaps the shop owner at the time, Alan Richards could have thrown some light on it but alas he was abroad and not known to us at that time and is sadly now lost to us all. He was a friend of Major and a fantastic wheel builder according to Ant Taylor. Subsequently another frame badged as both Tower Cycles and Alan Richards turned up that was built by Major which had a pedigree and a full MN number. Ian Thompsons find of the century. Ex- Ant Taylor. The 56-71 record suggests Major built about 150 frames for about 20 recorded shops and agents in this period but we speculate that there were probably some more possibly including a number that avoided the books and probably the taxman. Several more have ‘turned up’ like my MN7044. She was a roadside rescue fully badged as a MN that was not in the shop book and might have been sold through an agent. From the evidence to date, it seems most likely that the majority were numbered and badged as Major Nichols. Post 1971, ie in the Smethwick era, we obviously know there are frames that exist such as those built for John Williams of Neath’s personal use and sale from the late 70’s into the 1980s badged in John’s own name and all are expected to have a full MN number. To date there are no examples (known to us) of alternative re-badging for other shops post 1970. MN 11119. One of John William personal frames. Major set his ‘trademark’ punches and numberings in specific locations on the bottom bracket of his frames and the fork steerers. There will be another paper on his numbering system(s) in due course. This plays a part too. The Wilson ‘62 example with original finish, seat stay double fish-tail motif and now a comparatively confirmed ‘twin’ to the ‘67 proven example referred to earlier is almost certain but we can never say absolutely. Major said to someone whose frame had no number “Anyone can recognize my work, you don’t need one” (a number). His sheer arrogance stunned the rider and leaves us with the problem. The evidence on the ‘other frames’; those not badged as Major Nichols relies primarily on the 1956 to 1970 inclusive record. Those post 1970 rely on having a full MN and number stamp in the right punches and location. Good ‘other’ candidates will need to have a number in the right stamps, albeit contrary and like the 1962 Wilson, have original finish and Major’s appropriate topeye decoration in order to pass muster (but not 100%). The MN website team is always willing to give a view but we cannot give proof perfect and to be truthful we probably will miss some and offer no apologies for our failings. Only the man who made them knows the truth, we simply speculate as best we can. If you have a frame that fits the bill please get in touch and send us some photos please. Especially from the list below. Major’s style of a fine wrapover seatstay is a good place though not a definite, feature to start. We need the older generation to fill in our gaps please! Tell us what you remember before it is lost to our children and grandchildren! We will keep this paper as work in progress and look forward to the continuing challenge. 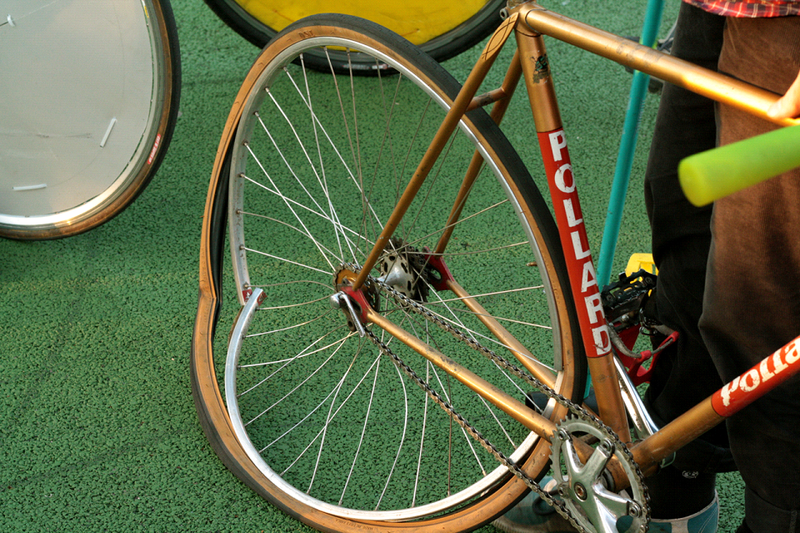 Criterion Cycles were supplied frames beyond 1957. This continued through until the mid 1960’s according to Tim Harris, then owner of Criterion and great friend of Major. The last was recorded in 1965 so we can with some certainty exclude them post 1970. Crown Cycles, Perry Barr. One bike built by Major in the 1970s, badged Crown Cycles is a possibility, but we understand from the second owner that it was refinished and re-badged for their racing team and it does have a full MN frame number perhaps suggesting his livery was intended. It’s last but one known seller Andy Hayes might fill in the gap. From mid 1956 until the shop move he built at least 30 frames for Wilsons. There is the Wilson from an earlier date circa 1962 with excellent and confirmed pedigree that regrettably is not verifiable from record but it’s original finish and features including the punches we recognize used to mark the bottom bracket which make it an undeniable candidate but with an altogether different and contrary number. There is also a Wilson from 1967 in original finish, which has been verified with the year and build numbers from the shop record but with no MN. Both share the same Italia design in ruby red flam finish. They appear to be his usual Italia model. We speculate that most Majors built for Wilsons were supplied in Ruby Red flamboyant finish as advised by Dave Clement and had Wilson head and seat tube transfers on black panels. We know of two variants in the transfer. The earlier shows a link to Sheffield as well as Birmingham. There is also Wilson’s typical block capitals on down tube of the earlier frame but only a small script only on the chainstays of the later verified example. Both have Major’s signature wrap-over seatstays with ‘Double fishtail’ decoration in original finish. Both were customized in manufacture and we know from a Wilson Catalogue and Major’s record for the 1967 example that this was the case and that the record shows a good proportion were built to individual order and specification. We have to assume he supplied frames for the pre 1956 and post 1971 periods. There is proven evidence for this to beyond 1980 with John Williams of Neath. We can add Rotrax to the shop list as an outlet because a little Gold MN RRS post 1971 has been found which was bought from Rotrax and had a long south coast career and which now resides in Warwickshire.